At 34 weeks pregnant, staying fit is different. The workouts are different. Now that there’s a medicine ball where my stomach use to be, the old routine just won’t work. I have to get much more creative to find things that are comfortable. The Gym – The gym has all the tools you need to be able to successfully modify your workout. When I’m there, I find myself reaching for the same things these days…Dumbbells, Stability Ball, yoga mat and jump box. With that arsenal, I’m able to work just about every muscle group safely not to mention all the cardio equipment. My Favorite cardio equipment right now is the elliptical, stairmill and I still enjoy a spin every now and then! The Pool – I have a bad back and I find relief in the pool. I know, it’s not fun to put a swim suit on while you’re pregnant but it will all be worth it to be able to find a little relief in the pool. From doing laps, to pool running, it all feels better with the help of the water. Find a pool that has kick boards, flippers, and/or pool weights, you can do a lot in the pool! 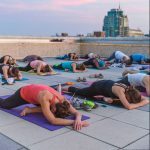 The Yoga Studio – The great thing about specialized facilities like yoga studios is that they have trained qualified professionals (at least they should) who know exactly what to help you do during the various phases of pregnancy. Many will have specific classes for prenatal yoga. I’ve taken a couple of these and they have really helped relieve some of the pressure on my joints and muscles. The Video Store – When was the last time you went to a video store? Anyway, there are tons of prenatal workout DVDs just waiting for you to pop one in. The fact is there are some perks to being pregnant. You now, for this short window of time, have an excuse to try different workouts without feeling like you’re compromising a goal or workout objective. This is a time for exploration and trying new things. Enjoy the time free of goals, go for a swim, try some modified sun salutations. It’s all good as long as your moving! 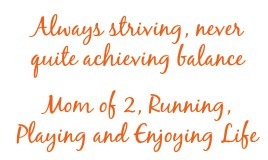 What are some of your secrets to staying fit during pregnancy? There are so many different ways to stay active while you’re pregnant and these are such great options. It can be hard sometimes but definitely doable. One thing that I did a lot was walk. Living in NYC, this was easy. I would walk to a farther subway station or get off a stop early. I would even walk home from Manhattan to Brooklyn after work sometimes (my husband would meet me). Love that you took advantage of living in NYC to get your walk on! I wish it were easier to do integrate here. 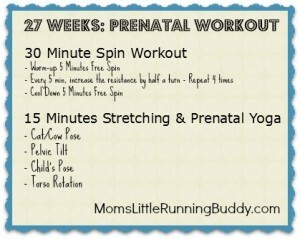 I’ve always been curious about how one modifies their workouts when pregnant. I’m mentally noting your post for the future, for me! I’m glad to see that working out is fairly easy for you, while pregnant. I lived in the pool when I was pregnant. Running, walking and using the foam weights were the perfect workout. The hubs and I would walk every night to connect and also dream about our little babies! there are still video stores?!?! I have no idea! I can’t tell you the last time I saw a blockbuster. 🙂 They probably exist somewhere. I loved swimming when I was preggo! You’re so right! 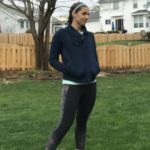 No need to sit on the couch all day- pregnant women can find alternatives, and I found it really helped improve my energy level and other complaints as well. I agree. I definitely think it helped to get the blood flowing. Kept me moving! My friend is loving the pool! I remember doing quite a bit of yoga, I was on bedrest with both pregnancies so I was really limited. It seems like those 9 months drag on and on, but they really are just a flash in our lives, yes? Enjoy your week ! Yoga has been really great! YOu’re right. I’m so ready for this to be over and I know I’ll be enjoying sleepless nights soon enough. Great tips for motivating ladies to keep at it. 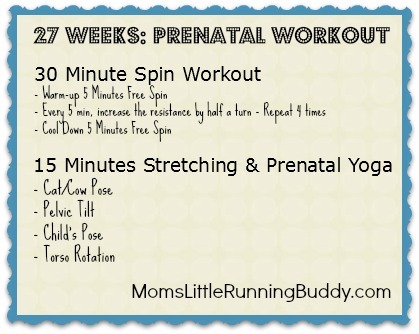 There are definitely plenty of ways to stay fit while preggo, even toward the end. totally! and it helps you remember that it feels good to stay active. You’re mission to stay fit during pregnancy is inspiring, and I hope I can keep up like that down the road when I have a little onE~! As a crossfitter, so many people said to me “I guess you have to stop working out now, huh?” I just stared at them, wondering where that logic came from! I am so glad that I continued to crossfit while pregnant, I could do lots of things the whole way thru, just had to modify them a little bit either with less weight or changing up the movement/intensity a bit. 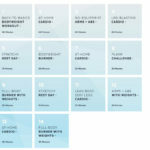 There’s also a website http://www.crossfitmom.com/ that lists daily workouts along with appropriate scaling optiions! Crossfit is great! Good for you for keeping at it! I know my girl Jess at BlondPonytail loves some Pregnancy Crossfit! 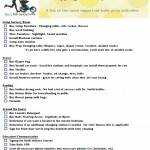 You are doing such a great job staying active during your pregnancy! Those are great tips. Back in the day when I had babies, I basically did no exercise. What was a while ago, and women weren’t really encouraged to do so (my youngest son is 31–yikes!). Great tips, swimming while pregnant felt amazing. Thanks! I really think people are scared to get in the pool but it feels soo good! I loved swimming & yoga when I was pregnant. Great tips! Thanks! There are a handful of yoga poses that I just can’t live without right now. from the “dad’s” perspective… it’s tough for us, too. If you are eating, heck, we want a bite. Great job at staying focussed on keeping fit.